Celebrating 30 years of operation in 2015, The Quantum Group’s founder Jeff Bruner describes his exceptionally innovative textile company in a recent interview with Textile World. ne gets the impression that 30 years of research and development (R&D) into problem solving and unique manufacturing capabilities provide a broad palate from which to operate and create an array of textile products and solutions. Founder Jeff Bruner likes to say that The Quantum Group takes on projects that other textile companies cannot, or will not, pursue. Quantum and its sister companies have a wide range of knitting and weaving capabilities, as well as fiber extrusion of mono- and multifilament yarns. Jeff Bruner established The Quantum Group in 1985 having just completed a five-year career at Burlington Industries. He had a degree in fabric design from the then Philadelphia College of Textiles and Science (PCT&S), now known as Philadelphia University. “I specialized in knitting and really wanted to be the best,” Bruner said. Later, he attended Leicester Polytechnic, United Kingdom, to continue his knitting studies. 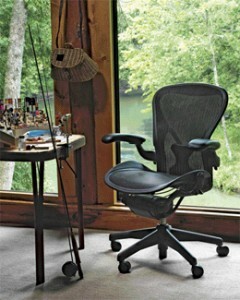 The Herman Miller Aeron® chair — conceived and manufactured by Herman Miller, designed by Don Chadwick and Bill Stumpf, and featuring The Quantum Group’s suspension fabric — was a breakthrough in ergonomic design. Photograph courtesy of Herman Miller. In the early days of the company, Bruner presented many seminars on multiple textile subjects and continued contract R&D work. One early customer was General Motors (GM). Quantum developed an elastomeric seat suspension material for GM. It was used as a B-surface material which means it’s not seen, replacing the metal springs underneath conventional fabric and foam used in the car seat. Quantum located a facility in High Point, N.C., that worked with Bruner to make samples. With these samples in hand, Bruner convinced GM to finance a dedicated assembly line to make seat suspensions to be used in Pontiacs, Buicks and Oldsmobiles. Bruner said this business lead came from a past student from his teaching days, a story that in Quantum’s early years would repeat itself. In the early 1990s, pretty much everything between the seat suspensions and medical yarns was the result of working with past students at General Motors and Meadox Medical, until Quantum was approached by Herman Miller. The Zeeland, Mich.-based furniture manufacturer had hired Bill Stumpf and Don Chadwick to design an office chair it had conceived of that did not feature the typical upholstered foam. The chair’s design became iconic and was at the forefront of ergonomic design. With conventional fabric suppliers showing little interest in the project the designers and Herman Miller needed to find an alternate source. “At that point, I said I wasn’t interested, and I resigned,” Bruner explained. Quantum’s business was growing. The company continued work with clients such as Meadox Medical, and also had a contract to build a yarn extrusion plant in Gibsonville, N.C., for a company called New Generation Yarns. “After I resigned, Herman Miller approached me again to return to the project,” Bruner said. “With about nine months left of development work, Herman Miller contracted with Quantum to finish the job and loaned me the funds to hire an employee and rent a building. That happened in early 1994, and then the chair was introduced a trade show in Germany called Orgatec — a big office furniture trade show in Cologne,” said Bruner. The fabric Quantum created for Herman Miller was branded Pellicle®, a word defined by Merriam Webster as “thin film.” According to Herman Miller, Chadwick and Stumpf designed the first office chairs that lacked traditional foam or padding, replacing it with a body conforming suspension fabric with an open, breathable construction. The design distributes weight evenly, while eliminating pressure points and heat build-up, according to the company.